Nestled amongst the trees and the busy but quiet business precinct of Delhi Road North Ryde is a hidden treasure known as Atlantis Bar & Dining Restaurant. As the name suggests, Atlantis is an establishment specialising in seafood but provides alternative dishes to please all manner of tastes. Atlantis Bar & Dining is not only a great place to dine but is an ideal place to enjoy a delicious cocktail prior to heading out on the town. The roomy yet still private surroundings of the bar offer a superb environment to rendezvous with friends to kick-start your evening. 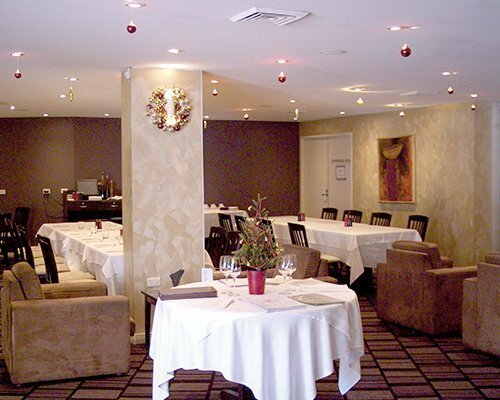 Residing in the Quest Hotel North Ryde for the last 12 years, Atlantis offers an open plan dining experience and yet still retains a high degree of intimacy for those wanting a traditionally quiet and subdued ambience. The décor is stylish and slick and reflects the high quality standard of the cuisine. Atlantis is open for breakfast, lunch and dinner every day of the year including Christmas Day and New Years Day. Restaurateur George Andreou has prepared a sumptuous fare for Mothers Day. Using only the freshest produce to create traditional and contemporary dishes, the Seafood Buffet selection consists of: fresh prawns, AAA Oysters Natural, smoked salmon, fried calamari and Fish& Chips, octopus, mussels; a selection of fresh salads; Soup of the Day; Antipasto Platter; red meat and chicken dishes; steamed rice, vegetarian pasta and selection of assorted desserts. Seafood Buffet now available seven days for lunch or dinner for minimum 30 people or more. Adults $65 per head; children under 12 $35 with kids under 4 FREE. Bookings can be made by phoning 8899 8980. Atlantis Bar & Dining Restaurant is located at Quest North Ryde, 58-62 Delhi Road North Ryde. 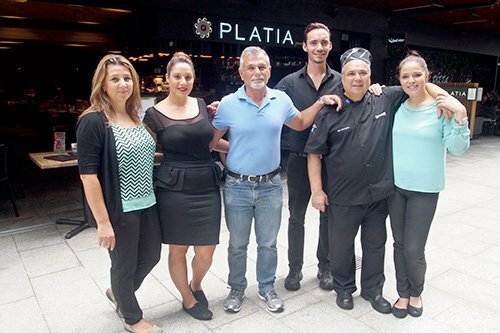 Meet the friendly team at Platia (from left) owner Skevi Stavrou, marketing guru Stella, owner Steve, barman Enrico, Head Chef Akis and manager Danielle Smith. TWT on-the-spot PHOTO. 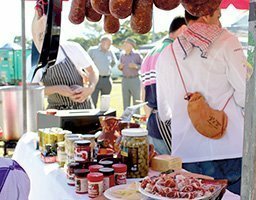 Top Ryde City’s renowned Platia Greek restaurant will celebrate Mothers Day with a rustic ‘Mamma’s Meze’ celebration. Located in the prestigious La Strada at Top Ryde City, Platia is offering mum’s a free glass of champagne on arrival and the Mamma’s Meze for only $65 per person. Manager Danielle Smith said the $65 special offer includes lunch an d dinner on Mothers Day. “You can opt for the Mamma’s Meze or our famous regular menu and family groups are welcome,” Ms Smith said. Children are welcome Head Chef Akis is from Cyprus and specialises in Greek Cypriot fusion food. His favourite dish is called Sheftalia, which is a skinless cepinette sausage cooked over volcanic rock and served with salt and lemon. “Our barman Enrico has created some great cocktails including one with an origami swan made out of apple,” Ms Smith said. Platia is the Greek term for a town or market square. “We are the place where rich food meets Greek culture and we have a wonderful, friendly team of staff to make your fine dining experience a memorable one,” she said. Platia is fully licenced and has a huge selection of Greek and other wines. It is open for lunch from 11.30am until 3pm on weekdays and until 3.30pm on weekdays. Evening dining commences from 5.30pm until late, every day. The restaurant is family owned. Bookings can be made by phoning 9807 3000. A new restaurant in West Ryde is offering a Mothers Day special to tempt families to experience the delights of North Indian cuisine. The Taste of Tandoor restaurant opened last week and manager Ray Singh hopes local families will take advantage of an ‘all you can eat’ dining experience for only $25 per person. Mr Singh has 30 years experience in cooking and presenting outstanding North Indian food at restaurants in Epping and Eastwood and said the menu at the new West Ryde restaurant builds on this experience. 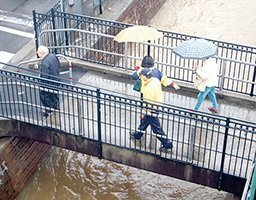 “Although this is my first week in West Ryde, I’ve been delighted that so many of my longstanding customers have come back,” he said. “It is my belief that if you give good food and good service customers will come back and we have good food and good quality. Mr Singh said that unlike some restaurants that serve North Indian cuisine, he doesn’t pre-freeze the food. “Some Indian restaurants pre-cook and freeze but here everything is fresh and freshly cooked,” he said. Alongside the outstanding Butter Chicken, Mr Singh said popular menu items include the Rogan Josh Lamb, the Prawn Malabar and the Palak Paneer. “With the Butter Chicken the chicken thigh fillet is first grilled in the tandoor, then cooked to perfection in tomatoes and cream,” he said. “The Rojan Josh is a lamb curry cooked in onion, tomato, ginger and garlic gravy garnished with fresh coriander while the Prawn Malabar presents mild curry prawns cooked in coconut cream with peas. There are ten entrees to choose from and more than ten choices of Indian breads. All means offer traditional North Indian accompaniments as well as desserts and drinks. “The Mango Lassi is an Indian yoghurt-based drink with a mango flavour and is very popular,” he said. The Taste of Tandoor is located at 1037 Victoria Road in West Ryde, a few doors up from the West Ryde Hotel, and is open seven nights a week from 5pm until late. Georgio Colosi – owner operator of the family run La Perla Seafood Ristorante at 255 Victoria Road Gladesville – has been dishing up fine quality seafood for 37 years. Popular Georgio braves the early morning Fish Market auctions two-three times a week ensuring the extraordinary freshness of the seafood served. Winner of a Most Outstanding Restaurant Award, La Perla offer a variety of seafood, meat, pasta and pizza and Mr Colosi is recommending dishes be shared. Diners get a choice from the condensed al a carte menu and you only eat what you want. 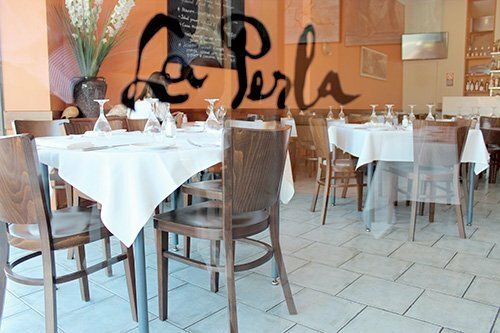 La Perla offer a range of entrees, pasta and main courses to suit most palates and also have an impressive selection of desserts. Pasta dishes include Spaghetti Marinara – spaghetti with mixed seafood and tomato; Penne Al Granchio – penne with crab meat, garlic, chilli, basil, white wine and freshly chopped tomato; Linguine Scampi – linguine cooked with scampi and cherry tomato in a white wine sauce; Homemade Gnochhi Verde – cooked with prawns and snowpeas; Linguine Vongole – cooked with white wine and cherry tomato. Main dishes include Grigliata Di Mare – selection of fresh local seafood grilled; Boneless flathead – in beer batter with shoestring chips and tartare sauce or Swordfish Pizzaola with olives, capers, chilli in a napolitana sauce. The restaurant is fully licensed and open for lunch Tuesday to Friday from 12 noon to 3pm and dinner Tuesday to Sunday from 6pm to 10pm. Bookings 9816-1161.